Can Wireless Tablets Bridge The Digital and Education Divide? D.C. Caribbean Carnival No Longer In D.C.
All politics is local in the most political city in America. From newspapers to neighborhood blogs, all the media we are consuming and considering. The stories that came before us influence what comes next. Anniversary of MLK Assassination And The Riots That Changed D.C. In Your Words: Black or African American? Beneath the buttoned-down surface of the city, DC is full of history, diversity, joy and life. Dana Tai Soon Burgess & Co.
Can A Party Change Perceptions Of Anacostia? Urban affairs, neighborhoods, subways and the people who are affected by them all. Will Chains Fill 14th Street? Critics have dubbed a feature for GPS tools that would direct pedestrians to take alternate routes based on crime and demographic data the “Avoid the Ghetto” app. They say it could redirect people away from low-income or minority neighborhoods, or reinforce stereotypes about such areas. 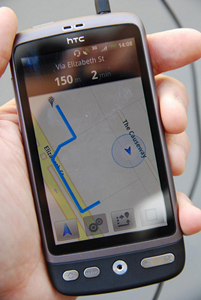 Others say the app makes GPS devices more intelligent by giving people useful information. According to Microsoft’s patent for the app, which was approved last month, pedestrian routes can be calculated relying on demographic and violent crime data, among other things. The potential result: a pedestrian would be directed to walk a route where violent crime falls below a certain threshold, according to the patent. Dubbing neighborhoods as “dangerous” can be tricky. Calculating the probability that you’ll be the victim of a crime is actually quite difficult, University of Maryland criminology professor Charles Wellford says. For one, it’s most useful when examined by block, not by an entire neighborhood. That’s because crime is highly localized, partially having to do with the conditions of specific locations, he says. However, calculating an accurate probability by block is difficult because it’s affected by how many people travel there, not just by who lives there. For example, downtown D.C.’s population swells during the day as commuters increase the city’s daytime population by 73 percent. Is the probability that you’ll be the victim of a crime in downtown D.C. based based on how many people live there? The app patent is unclear on how it would take that into account. Wellford cites another example: he says the “most dangerous” place in San Francisco last weekend was Candlestick Park, where the New York Giants played the San Francisco 49ers. “Any city that has an NFL team, the day they play at home, there’s a lot of crime around and within the stadium,” he said. The app could potentially tell you to avoid that area. Depending how the data is used, the app can “paint pictures of communities that aren’t useful or accurate,” Wellford says. Wellford says there is a “triangle” used to explain most crime: how motivated an offender is, the vulnerability of victims and the “absence of guardianship.” That last point refers to low police presence or having few people around. If an app tells pedestrians to avoid an area, it could potentially mean fewer eyes on the street, making it easier for people to commit crimes. The other issue has to do with the types of crime. Pedestrians should be interested in the types of crimes that affect them. Victims of armed robberies don’t usually know their assailants, and robberies often happen outdoors, Wellford says. But victims of homicides, sexual assaults and aggravated assaults tend to know their assailants, and such crimes typically happen indoors. Not always, “but a substantial number,” Wellford says. D.C.’s first and third police districts led the city in total number of crimes, according to 2009 Metropolitan Police Department statistics. Those districts include communities such as downtown, Logan Circle, U Street and Adams Morgan, areas with high concentrations of residents and businesses. The third district also leads the city in robberies. The seventh district, which includes Wards 7 and 8*, has the most homicides. So which areas are “most dangerous,” and for whom? Figuring out if an area or block feels dangerous can be based on a number of things: personal experience, a gut feeling, stereotypes. Wellford says if the app does provide accurate information, it could be useful in helping people decide whether they want to adjust their behavior, such as walking down a different road. In the end, such micro-decisions about safety are highly personal. One person may feel safe walking down the street at night in Columbia Heights or Anacostia, while another person wouldn’t. So should you allow an app to change your mind, or is it just a useful tool giving you a suggestion? *This post originally stated the police department’s seventh district includes Ward 7; it’s in the department’s sixth district. Racial Stereotyping: What's Alcohol Got To Do With It? Obviously, the whole term ‘ghetto’ has become a pejorative word for people of color in our popular lexicon now. I find it rather disgusting to hear people use the term ‘ghetto’ to describe anything in a negative light. This app also lends credence to the labeling of neighborhoods as ‘bad’ areas such as S.E. DC or PG county simply because they have dense minority populations. I can just hear the jokes now-’My app basically says not to drive through any parts of PG County lol!’. I think it’s quite sad and shows we are not ‘post-racial’ as some pundits would like to suggest. speaking of generalities, lack of information and stereotypes…you might want to revise your statement about Ward 7 being near the 7th district police department by saying “a portion of Ward 7.” As a Ward 7 resident that lives down the street from 6th District headquarters, I’d say you are overgeneralizing that all of East of the River is near 7th District police department. That’s untrue. Such subtleties lend themselves to misinterpretation about EOR communities and policing. if there is any useful, non-racialized pretext for this app, it is nullified by it highly pejorative name, as a previous commenter noted. Thank you for pointing this out. I’ve updated the post to reflect the correction. Right, it’s because of phone apps and racist white people that these areas are considered ‘bad’. Not because they actually have enormously high crime rates. What sort of mental gymnastics do you have to do to seriously write what you did? I’d rather be safe than politically correct. I can’t wait for this App. DCentric was created to examine the ways race and class interact in Washington, D.C., a city with a vibrant mix of cultures and neighborhoods. Your guide to the changing District is reporter Elahe Izadi. Who had the longest wait for an immigrant visa this month? How can students intelligently plan careers amid so many conflicting signals? In Portland: Can Freight Bikes Replace Trucks?